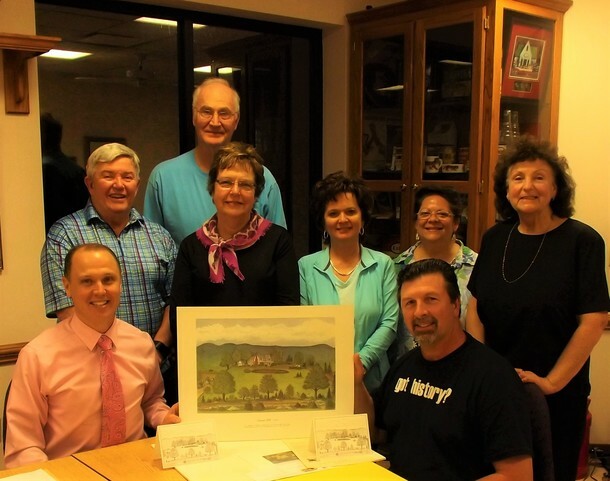 The JEB Stuart Birthplace was recently the recipient of artwork from the late Pat Gwyn Woltz, a local artist from Mt. Airy, North Carolina. This artwork depicts a scene of what the Laurel Hill home may have looked like. These generous donations were made available to the Birthplace from the foundation department from Surry Community College, Dobson, NC. Pictured at right are members of our Board of Directors and the art. (L-R) Brian Jessup, Treasurer, Dr. James Keesee, Tom Bishop, Coates Clark, Amy Sawyers, Secretary, Ronnie Haynes, Vice President, Cyndi Vipperman, and Mary Dellenback Hill.